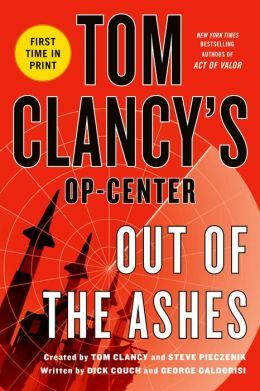 Like a phoenix from the flames, Tom Clancy’s Op-Center returns … only to immediately crash back down to earth. OUT OF THE ASHES is an archaic military thriller, more interested in bombarding readers with acronyms and jargons than telling a compelling story. However long Op-Center’s revival lasts, I won’t be around to see it. The first 100 pages of OUT OF THE ASHES are entirely dispensable. Seriously, the novel wouldn’t suffer for their demise. What is essentially an elongated prologue delves into the formation of the new Ops-Center following the demise of its previous incarnation. Following devastating bombings in sports stadiums across the country, the President demands the reformation of the old agency – and it’s done so over the course of the next hundred pages, culminating with the wrapping up of the whole storyline involving the stadium bombings. All that build-up for a meagre payoff. Infuriating. Then we cut to months later, Ops-Center now established, when a new threat emerges in the Middle East. A Saudi prince executes a nefarious scheme to fool the United States into attacking Syria. Will Ops-Center take the bait? Will their first true test be their last? Bloated with cardboard characters, OUT OF THE ASHES lacks thrills and the gusto the best Clancy novels had. He was never renowned for his character development, but at least Clancy’s action scenes had some punch. This novel doesn’t. It’s a watered down facsimile. I’m out.